Festive revelers, lots of food, loud Oom-pah music, and, of course, lots and lots of beer! 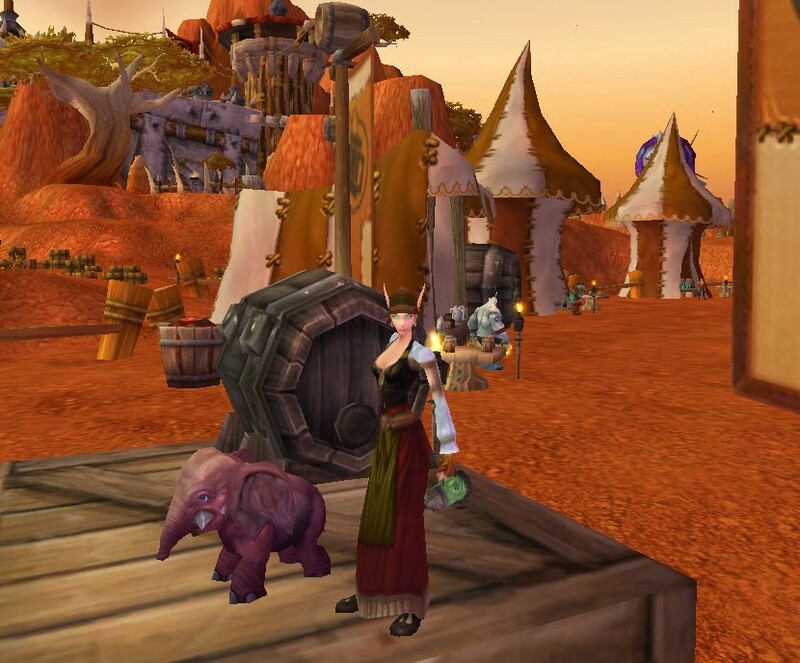 It’s the Oktoberfest in September: Brewfest! 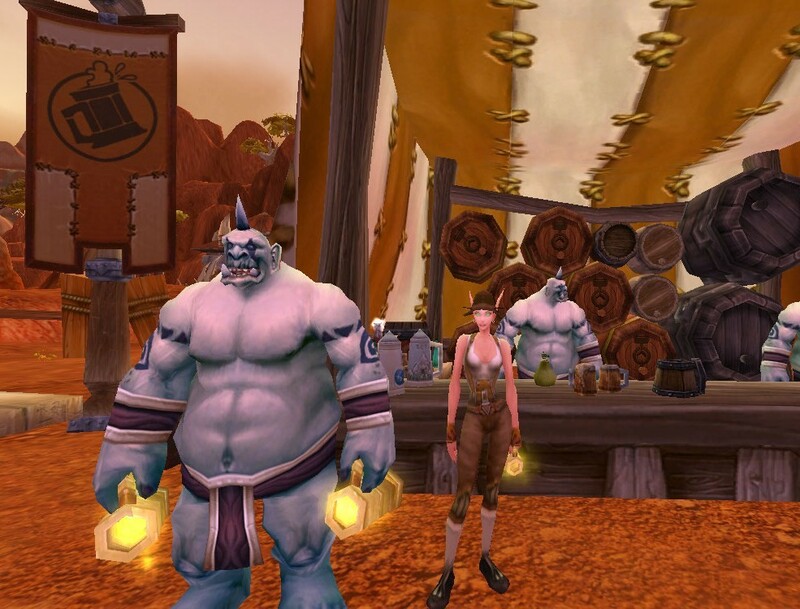 For starters, there is the traditional Brewfest garb to buy with Brewfest Prize Tokens earned through the seasonal quests for this event. 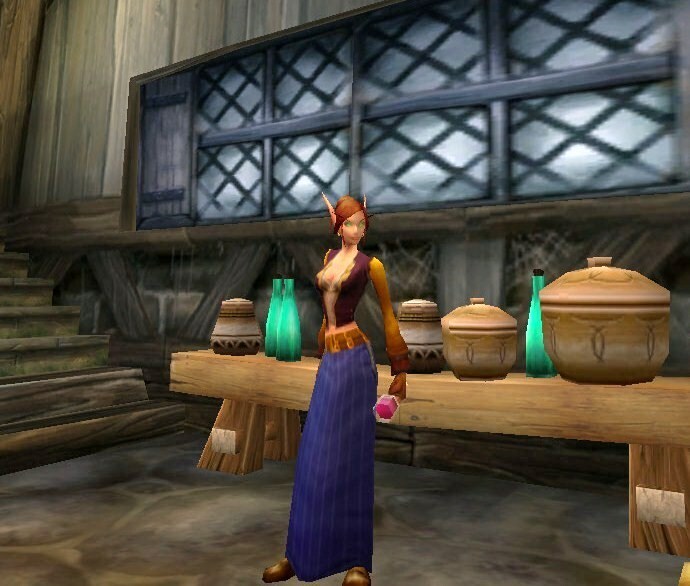 The Brewfest Dress can be worn with a wide variety of shirts, and with other accessories, like the Canvas Belt; however it also looks great on its own. The same outfit only with Kirina’s White Swashbuckler’s Shirt equipped. 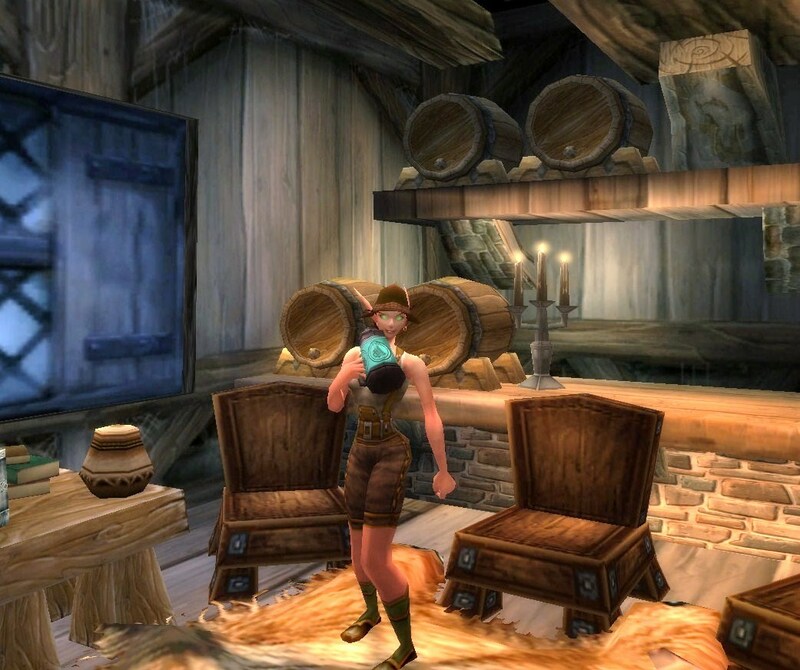 There is also the Brewfest Regalia – fun lederhosen – and the Brewfest Boots. These look great on both female and male characters. Kirina will get those when she has enough bag space…so, probably never ^_^ . I love Kirina’s Gossamer Pants. They are so versatile for being brown shorts. 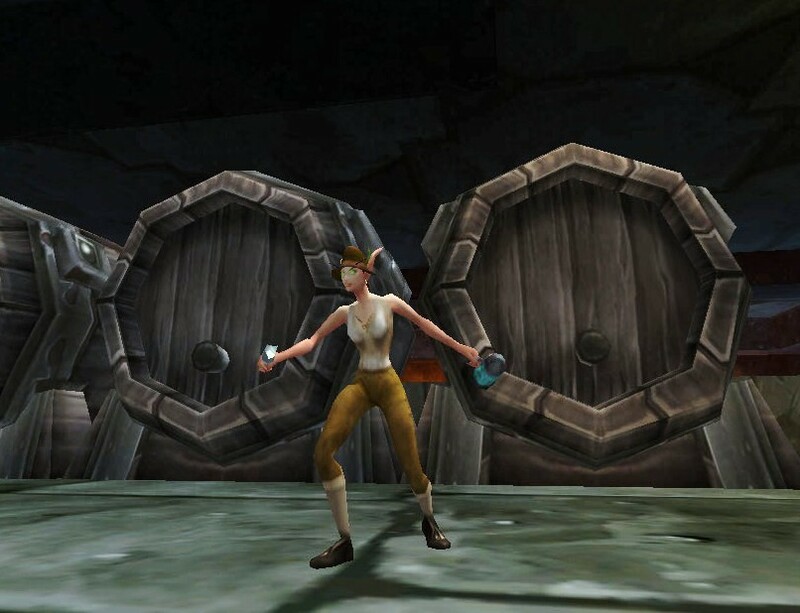 The Recruit’s Shirt used is a part of the starter outfits for Alliance Human/Gnome/Dwarf warriors. 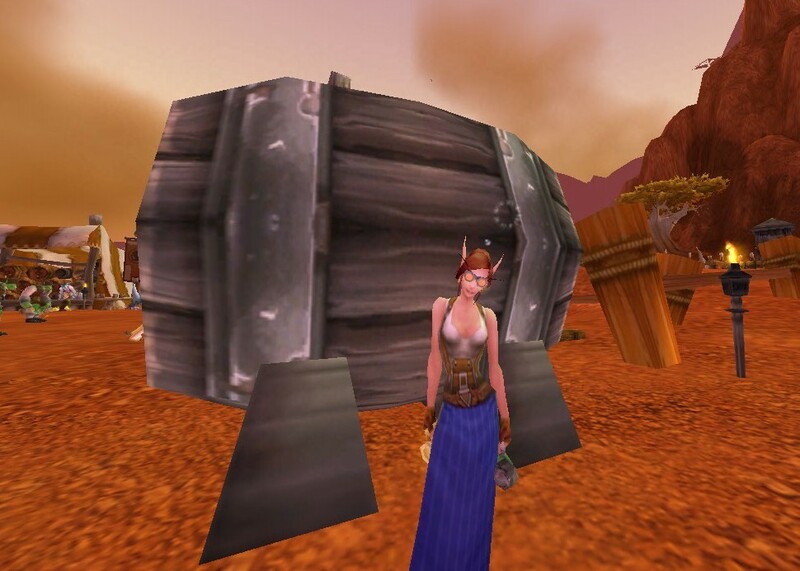 It can also be bought from Thomas Yance in Old Hillsbrad Foothills. The Padded Boots aren’t really boots as much as they are brown shoes with green knee-high socks, and they are a great alternative to the Brewfest Slippers/Brewfest Boots for a different mix of outfits. 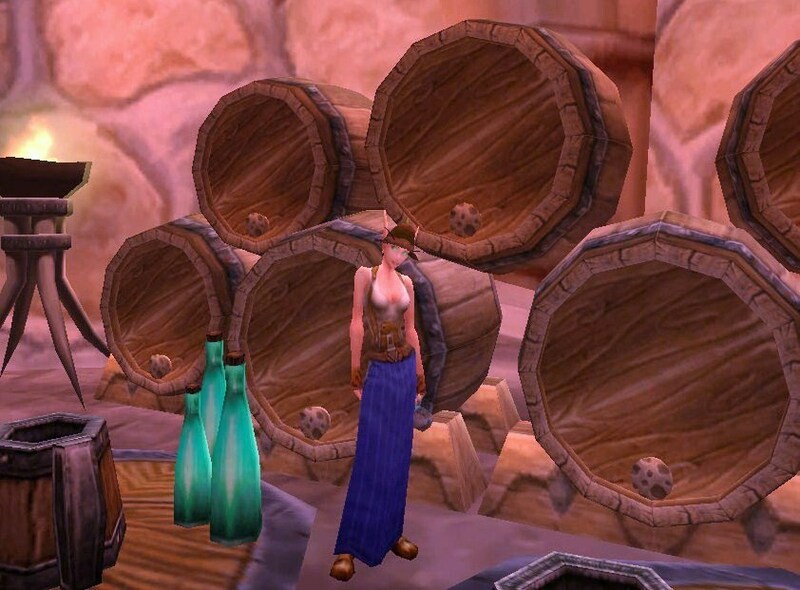 This outfit will also go with any of the Brewfest Hats. The Blue Brewfest Stein was the souvenir mug from Brewfest 2008. 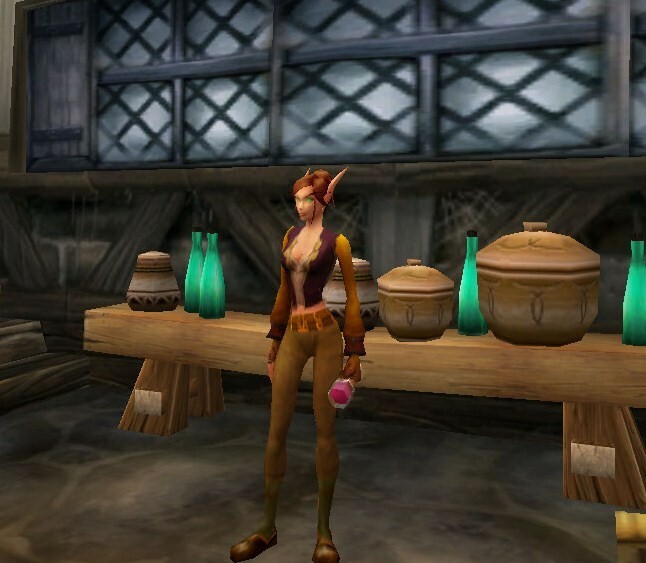 Any Brewfest mug or stein will work with these outifits. This is the same type of outfit as before, only with a less suspender feel to it. 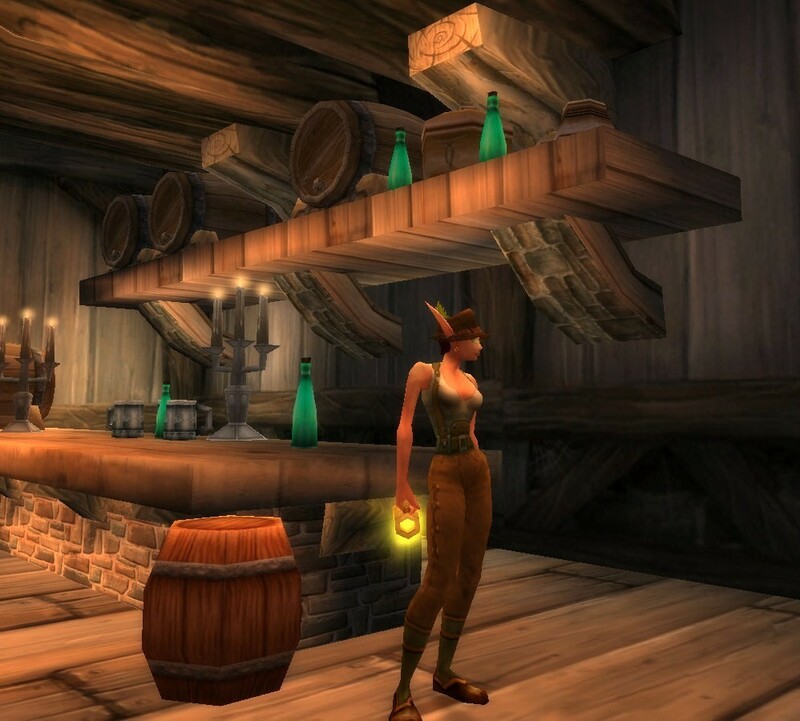 This outfit will also look great with the Green Brewfest Hat, and it matches the green feather in Kirina’s Brown Brewfest Hat. These next two outfits are more bartender-like, and would be great to wear while “barking” for a specific brewery. This outfit was built to look like a brown pair of overalls. The Stonemason Trousers could be replaced for a pair of Brown Linen Pants (as seen in the next outfit). The Mug O’ Hurt (very low world drop) is actually an one-handed mace, and as such, can be enhanced with a weapon enchant. The Mighty Intellect weapon enchant is the closest color of enchants to match the golden glows of the mugs held by the various Brewfest Barkers around the festival (the ones that toss you a beer). The enchant itself is very rare – enchanters can buy it once they’ve reached the revered reputation level for The Thorium Brotherhood. As mentioned before, this is the same type of outfit, only using the Brown Linen Pants. The Brown Linen Pants really don’t match the Lumberjack Jerkin, but, it’s still a decent alternative. The Lumberjack Jerkin drops from the boars roaming around Dun Morogh. Both the Lumberjack Jerkin and the Recruit’s Shirt are good substitutes for the Mixologist Tunic. Although the Mixologist Tunic is somewhat easy to farm for if you are a high enough level to solo “bosses” in Black Rock Depths, the other two are non-BOE and can be sent to an alt-character’s bank to save space. 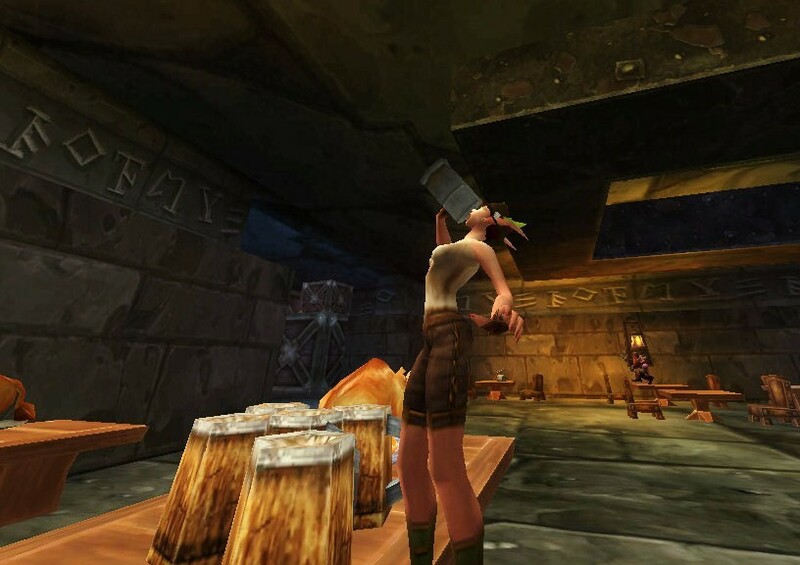 The same mob who drops the Mixologist Tunic also drops the Barman Shanker, which is the inspiration piece for this next type of outfit: the Brewfest Drunk. Any other “wife-beater” shirt, like the Sleeveless T-Shirt will work just fine in this outfit as well. 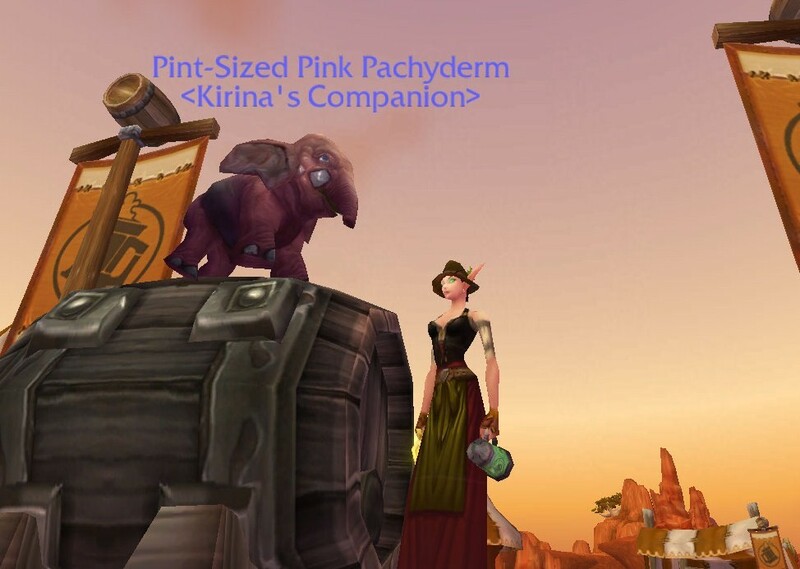 I wish I could make Kirina do a staggering “RP walk”, like she really was drunk. A sharp shattered bottle dagger, like the Barman Shanker, or one of its equivalents (like Brewfest 2009’s Direbrew’s Shanker 2.0, is an essential piece to this outfit to give it that ill-tempered, abrasive drunk feel. Shout obscenities while in this outfit, and have a couple of Empty Brew Bottles to smash on the ground, or on other players ^_^. A close-up on Kirina’s Barman Shanker. 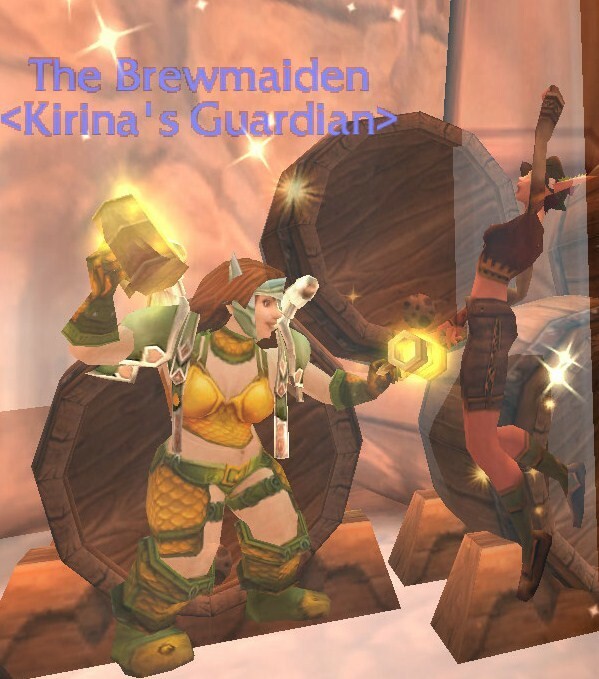 The Brewmaiden NPC is summoned by the Brightbrew Charm trinket that was obtainable in Brewfest 2008. For 2009, there is a new charm for the 80 level cap, the Bubbling Brightbrew Charm, but, it works the same way. 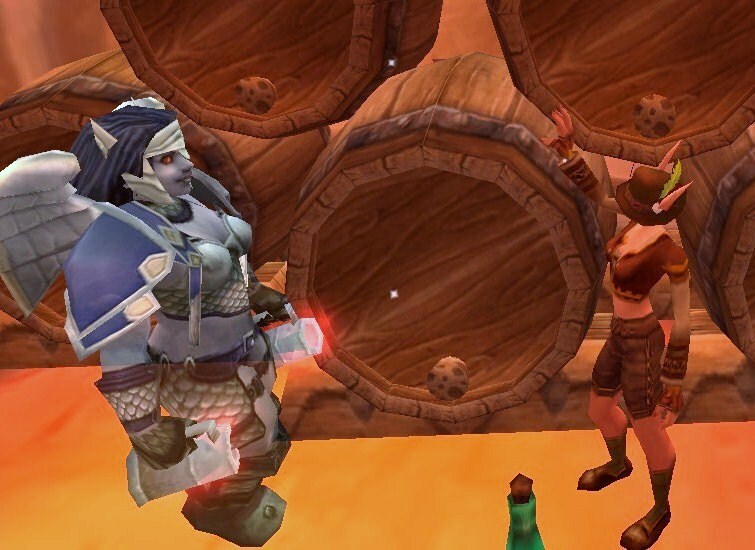 She is a very handy NPC to have around; she’ll throw you a beer if you /Wave at her. 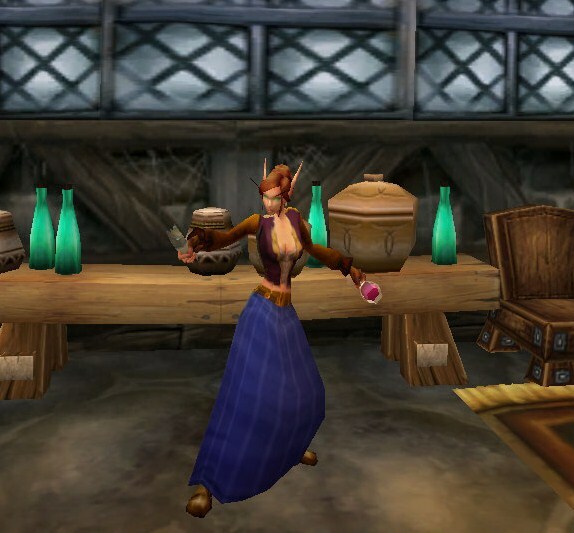 The Brewmaiden for the Balebrew Charm – similar to the 2009’s version Bitter Balebrew Charm. This outfit is similar to the one before, only a little bit more girlie with the substitution for the Simple Kilt (which, I wish was brown in this case ^_^). The Ornate Drinking Stein can be replaced with any other desired stein. This is another Simple Kilt outfit that is of the same style as the make-shift lederhosen outfit and/or as the bartender outfit (the glowing Mug O’ Hurt can be a stein substitute). Casual and different, yet still festive for Brewfest. Even though it is a “Brew”fest, there are some wine vendors hanging around the festival brew gardens to include all sorts of drinkers for this event. So…for all you winos (LoL, term used in good humor ^_^) out there, try outfits like these on for size. This outfit, in my opinion, has a classic French country-side feel to it. It’s a great outfit even if your character is not partial to wine drinking. The Gossamer Gloves can be replaced with any other form-fitting gloves to meet one’s armor availability (this is also the case for the previous outfits where these gloves were used). I added the White Swashbuckler’s Shirt underneath the Simple Dress to make the dress more for fall-time instead of being more for spring when left short-sleeved. The Starfire Vest is a great chest piece for RP. The style is simple, and the colors are complimentary for every race. Adding the Gold Filigreed Doublet shirt makes the outfit more Bavarian for this Oktoberfest based world-event. 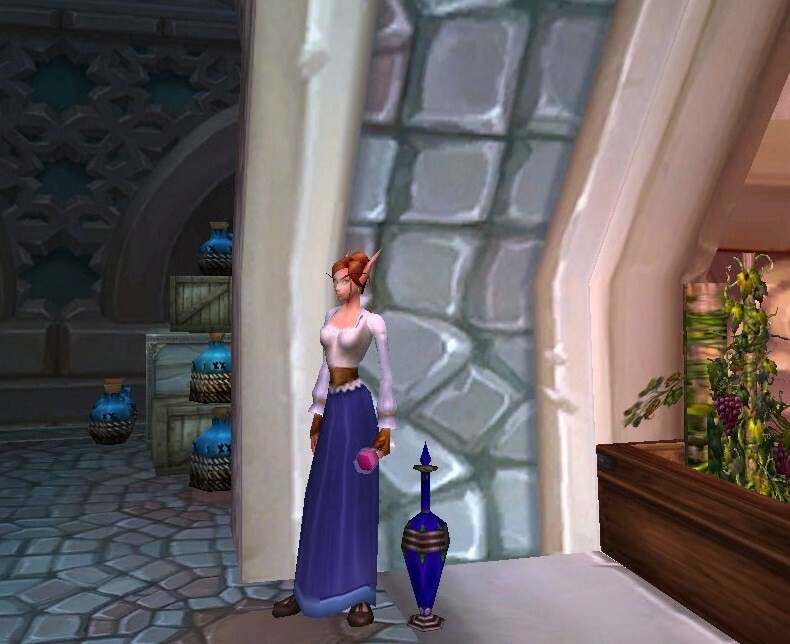 The Purple Brewfest Hat would look great with this as well. The same outfit, only with the Barman Shanker as an added feature. “Winos” can be mean drunks, as well ^_^. What’s great about broken bottle daggers, like the Barman Shanker, is that it can be used for both type of drunk outfits and still fit in. Again, having some Empty Brew Bottles handy to throw in passion, is never a bad idea. These look the same as the Blix’s Eyesight Enhancing Romance Goggles (which have an equally drunken effect ^_^), but are basically free. You can get a pair of these by talking to the same quest givers that give out the quests Pink Elekks On Parade and Catch the Wild Wolpertinger!. Hopefully, these won’t disappear after Brewfest is over. They do T_T …Oh well, I guess the Blix’s Eyesight Enhancing Romance Goggles are the only permanent alternative goggles for non-engineers to wear throughout the year. 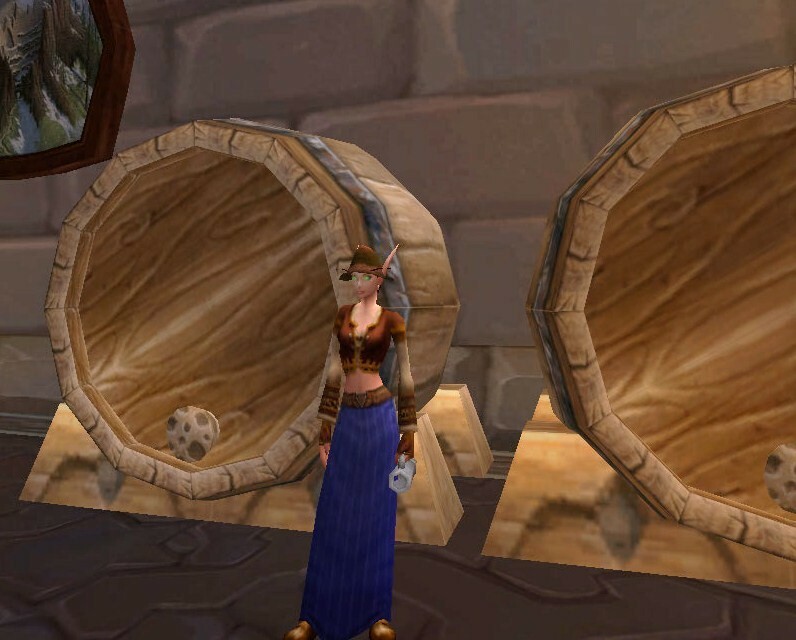 And, as how I end all my articles, I hope this one gave you some great ideas on how to make your own original Brewfest outfit(s). Be sure to take lots of screenshots of all those drunken moments!